WSBK Donington Park Race 1 results | IAMABIKER - Everything Motorcycle! 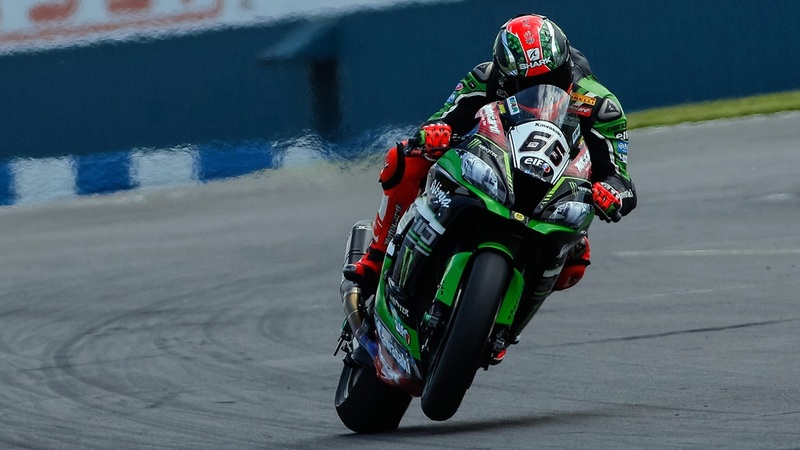 Tom Sykes has extended his winning streak at Donington Park in World Superbikes (WSBK) to an incredible seven races in a dramatic first race which saw Chaz Davies fall twice and out of contention. Rea also run off track besides being plagued by false neutrals which limited his progress to third. After a difficult start from pole position Sykes was roughed up and dropped back to fourth. Early race drama was to unfold ahead as Chaz Davies crashed at Goddards on lap seven while leading fellow Kawasaki rider Rea also ran wide at the same corner a few laps later to drop from second to fourth. Misfortunes all around promoted Sykes into second and he hunted down the leader Davide Giugliano, passing him on the 18th lap and then went on to take victory by almost three seconds. Rea held on to continue his feat of finishing on the podium in every race so far this year and holding onto the championship lead ahead of Davies.